Chorea caused by gabapentin has been reported in the literature. Chorea is very distressing to patients and causes significant morbidity. We need to be aware that such a symptom can be directly caused by drugs such as gabapentin. This would prevent overinvestigating such cases and expedite patient recovery. In this study, we report a case of a young female who developed hemichorea shortly after taking a small dose of gabapentin for shoulder pain and resolved within a few days after discontinuing the drug. We have also performed a literature review of all cases of gabapentin-induced chorea. Chorea is a clinical entity belonging to a group of disorders collectively named hyperkinetic disorders. Chorea classically manifests as an irregular, nonrhythmic, nonstereotypical, random, and involuntary movement. Chorea can be caused by a number of conditions categorized into either hereditary or acquired and include neurodegenerative, infectious, vascular, and drug induced. Drug-induced chorea along with Huntington's disease is considered to cause the majority of cases of chorea. Drugs that have been associated with developing chorea include dopaminergic agents (catechol-O-methyl transferase inhibitors, dopamine agonists, and levodopa), dopamine-blocking agents (amantadine and anticholinergics), dopamine-depleting agents (reserpine and tetrabenazine), and anticonvulsants including gabapentin among other classes of medications. There are only around eight case reports of gabapentin-related chorea in English literature. We report a case of a young female who developed chorea after being treated with gabapentin for neuropathic pain. A 39-year-old Asian female with no medical history presented to the emergency department with right upper limb abnormal movement associated with pain. The movement was described as involuntary, random, and jerky and localized to the right upper limb. She did not have weakness, numbness, or any other neurological symptoms, no previous similar symptoms reported, and no family history of any neurodegenerative or other neurological diseases. She had presented 1 month previously to the emergency department with right upper limb pain mainly in the shoulder and upper arm and was discharged on paracetamol and diclofenac gel. Her right upper limb pain was not improving, and so she decided to seek further medical advice in a private clinic where she was started on gabapentin 300 mg once daily 10 days before presentation. On the 2nd day after receiving gabapentin, she described that she started having an involuntary movement that was localized to her right upper limb causing significant distress. Her examination was only remarkable for spontaneous, jerky, irregular movements in her right upper limb and milkmaid's grip sign was positive. The rest of her examination including vital signs was normal. Magnetic resonance imaging (MRI) of the head was normal except for a mild darkening of bilateral dentate nuclei and, to a lesser extent, globi pallidi on T2 and SWI sequences of unclear significance. Thyroid function test was normal. Blood counts were normal and peripheral smear did not detect any acanthocytes or other abnormalities. Antistreptolysin O titer was within normal. Workup for Wilson's disease was negative including a normal slit-lamp examination by an ophthalmologist. Full autoimmune workup was also unrevealing. On admission, gabapentin was discontinued, and the patient was started on risperidone. She had a marked improvement in her symptoms and her abnormal movements completely resolved over 1 week. She continued to have right upper limb and shoulder pain, and MRI shoulder revealed a supraspinatus tendinopathy/partial interstitial tear with tendinosis of the subscapularis tendon and mild subacromial and subdeltoid bursitis which responded to treatment with naproxen. On discharge, the patient was totally asymptomatic with no abnormal movements or pain. Chorea is believed to be caused by an imbalance between the direct and indirect pathways located in the basal ganglia. The nigrostriatal pathway within the basal ganglia regulates feedback between the thalamus and the motor cortex through a system of positive and negative regulatory synaptic pathways. The basal ganglia metaphorically act as a brake for the motor thalamus and the midbrain extrapyramidal area. When the inhibitory mechanism of the basal ganglia is reduced, movement disorders such as chorea arise. Experiments have shown, however, that this phenomenon does not completely explain the appearance of chorea. The possibility remains that the movement associated with chorea originates somewhere else in the motor system that has yet to be elucidated. Gabapentin appears to increase the synthesis of gamma-aminobutyric acid (GABA), the primary inhibitory neurotransmitter in this motor pathway. In rat models, gabapentin was shown to decrease the activity of GABA neurons in the substantia nigra. Because not all patients who take gabapentin develop chorea, some aberrant neurophysiology likely predisposes certain patients to this side effect. In our case and after ruling out autoimmune disorders including lupus and antiphospholipid syndrome, neurodegenerative disorders, and infectious etiologies and given the relationship between symptom onset with the initiation of gabapentin and resolution with the discontinuation of gabapentin, we have diagnosed this patient as having gabapentin-induced chorea. Using the research of Naranjo et al., the probability that our patient's chorea was an adverse drug reaction is “probable” with a score of 6 on a scale of definite >9, probable 5–8, possible 1–4, and doubtful <0, but her 300 mg dose appears to be the lowest reported dose associated with this side effect. Our case presents a young and healthy patient who was treated for presumed neuropathic pain with gabapentin. In literature, we have found that our patient is the youngest to have developed this rare side effect of gabapentin; in addition to that, 300 mg once daily is the lowest dose to have been ever reported. The time between symptom onset and initiation of therapy was <2 days with a small dose of 300 mg on the contrary to previous case reports that described chronic gabapentin use and higher doses. In addition, the peculiar clinical presentation of hemichorea seen in our patient was only reported once previously. 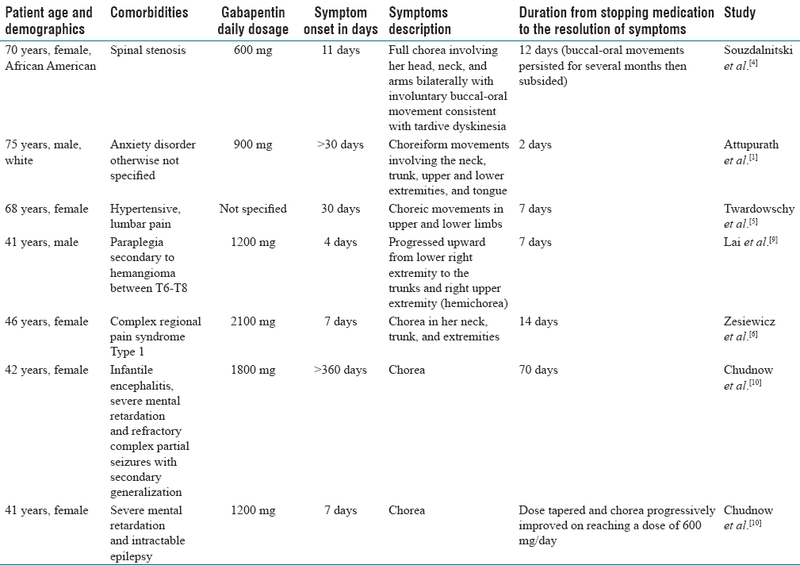 [9,10] All gabapentin-induced chorea cases reported are shown in [Table 1]. Our case report confirms the previous observations of the association between administration of gabapentin and development of choreiform movements. In particular, the onset and resolution of chorea were rapid and occurred at the lowest dose reported so far. Prompt recognition of gabapentin as a potential cause of chorea is important to help relieve prolonged patient suffering and avoid extensive use of investigations and help save resources. A larger study looking at the exact mechanism of gabapentin-induced chorea and the risk factors for its development is needed. Attupurath R, Aziz R, Wollman D, Muralee S, Tampi RR. Chorea associated with gabapentin use in an elderly man. Am J Geriatr Pharmacother 2009;7:220-4. Bhidayasiri R, Truong DD. Chorea and related disorders. Postgrad Med J 2004;80:527-34. Souzdalnitski D, Chang AK, Guirguis M. Chorea in a chronic pain patient using gabapentin. Ochsner J 2014;14:276-8. Twardowschy CA, Teive HA, Fernandes AF, Búrigo IP, Lange M, Werneck LC, et al. Chorea due to gabapentin monotherapy in a not encephalopatic patient. Arq Neuropsiquiatr 2008;66:107. Zesiewicz TA, Shimberg WR, Hauser RA, Robinson W, Wilson MC, Sullivan KL. Chorea as a side effect of gabapentin (Neurontin) in a patient with complex regional pain syndrome type 1. Clin Rheumatol 2008;27:389-90. Delaruelle Z, Honoré PJ, Santens P. Adult-onset Sydenham's chorea or drug-induced movement disorder? A case report. Acta Neurol Belg 2016;116:399-400. Lai MH, Wang TY, Chang CC, Tsai KC, Chang ST. Hemichorea associated with gabapentin therapy with hypoperfusion in contralateral basal ganglion – A case of a paraplegic patient with neuropathic pain. J Clin Pharm Ther 2008;33:83-6. Chudnow RS, Dewey RB Jr., Lawson CR. Choreoathetosis as a side effect of gabapentin therapy in severely neurologically impaired patients. Arch Neurol 1997;54:910-2.